This CPG provides the rationale and guidelines for WB transfusion, including but not limited to product definitions, indications, collection, storage, testing, transfusion, and documentation. Tissue oxygenation monitoring in the field: a new EMS vital sign. Sagraves SG, Newell MA, Bard MR, Watkins FR, Corcoran KJ, McMullen PD, Rotondo MF J Trauma. 2009 Sep;67(3):441-3; discussion 443-4. Continuous noninvasive tissue oximetry in the early evaluation of the combat casualty: a prospective study. Beekley AC, Martin MJ, Nelson T, Grathwohl KW, Griffith M, Beilman G, Holcomb JB. J Trauma. 2010 Jul;69 Suppl 1:S14-25. Monitoring tissue oxygenation by near infrared spectroscopy (NIRS): background and current applications. Scheeren TW, Schober P, Schwarte LA. J Clin Monit Comput. 2012 Aug;26(4):279-87. doi: 10.1007/s10877-012-9348-y. Epub 2012 Mar 31. Duration of red blood cell storage is associated with increased incidence of deep vein thrombosis and in-hospital mortality in patients with traumatic injuries. Spinella PC, Carroll CL, Staff I, Gross R, McQuay J, Keibel L, Wade CE, Holcomb JB. Crit Care. 2009 Sep 22; 13(5):R151. Association between length of storage of red blood cell units and outcome of critically ill children: a prospective observational study. Karam O, Tucci M, Bateman ST, Docruet T, Spinella PC, Randolph AG, Lacroix J. Crit Care. 2010 Apr 8; 14 (2):R57. Association between length of storage of transfused red blood cells and multiple organ dysfunction syndrome in pediatric intensive care patients. Gauvin F, Spinella PC, Lacroix J, Choker G, Ducruet T, Karam O, Hébert PC, Hutchison JS, Hume HA, Tucci M. Transfusion. 2010 Sep; 50(9):1902-13. Does the storage duration of blood products affect outcomes in critically ill patients? Spinella PC, Doctor A, Blumberg N, Holcomb JB. Transfusion 2011; Aug;51(8):1644-50. Red blood cell transfusion and increased length of storage are not associated with deep vein thrombosis in medical and surgical critically ill patients: a prospective observational cohort study. Katsios C, Griffith L, Spinella PC, Lacroix J, Crowther M, Hebert P, Meade M, Geerts W, Rabbat C, Cook D. Crit Care. 2011 Nov 2;15(6):R263. Effect of processing and storage on red blood cell function in vivo. Doctor A, Spinella PC. Semin Perinatol. 2012 Aug;36(4):248-59. Timing and location of blood product transfusion and outcomes in massively transfused combat casualties. Cap AP, Spinella PC, Borgman MA, Blackbourne LH, Perkins JG. J Trauma Acute Care Surg. 2012, 73: S89-S94. Risks associated with fresh whole blood and red blood cell transfusions in a combat support hospital. Spinella PC, Perkins JG, Grathwohl KW, Repine T, Beekley AC, Sebesta J, Jenkins D, Azarow K, Holcomb JB; 31st Combat Support Hospital Research Working Group. Crit Care Med. 2007 Nov;35(11):2576-81. Fresh whole blood transfusions in coalition military, foreign national and enemy combatant patients during Operation Iraqi Freedom at a U.S. combat support hospital. Spinella PC, Perkins JG, Grathwohl KW, Repine T, Beekley AC, Sebesta J, Jenkins D, Azarow K, Holcomb JB. World J Surg. 2008 Jan;32(1):2-6. Epub 2007 Nov 9. Pediatric trauma in an austere environment. Spinella PC, Borgman MA, Azarow KS. Crit Care Med. 2008 Jul; 36 (7 Suppl):S293-296. Blood use on the battlefield: Is fresh whole blood making a comeback? Hess JR, Spinella PC, Holcomb JB. Blood Matters. Aug 2008:26;9-10. Warm fresh whole blood is independently associated with improved survival for patients with combat-related traumatic injuries. Spinella PC, Perkins JG, Grathwohl KW, Beekley AC, Holcomb JB. J Trauma. 2009 Apr;66(4 Suppl):S69-76. Comparison of platelet transfusion as fresh whole blood versus apheresis platelets for massively transfused combat trauma patients (CME). Perkins, Cap AP, Spinella PC, Shorr AF, Beekley AC, Grathwohl KW, Rentas FJ, Wade CE, Holcomb JB, 31st Combat Support Hospital Research Group. Transfusion. 2011 Feb; 51(2):242-52. Symposium on fresh whole blood for severe hemorrhagic shock: From in-hospital to far forward resuscitations. Spinella PC, Strandenes G, Bekkerstad Rein E, Seghatchian J, Hervig T. Transfusion and Apheresis Science 46 (2012) 113-117. Fresh Whole Blood Use for Hemorrhagic Shock: Preserving Benefit While Avoiding Complications. Spinella PC, Reddy HL, Jaffe JS, Cap AP, Goodrich RP. Anesth Analg. 2012 Oct; 115(4): 751-8. Whole blood in the management of hypovolemia due to obstetric hemorrhage. Alexander JM, Sarode R, McIntire DD, Burner JD, Leveno KJ. Obstet Gynecol. 2009 Jun;113(6):1320-6. Effect of a fixed-ratio (1:1:1) transfusion protocol versus laboratory-results–guided transfusion in patients with severe trauma: a randomized feasibility trial. Nascimento B, Callum J, Tien H, Rubenfeld G, Pinto R, Lin Y, Rizoli S. CMAJ. 2013 Sep 3;185(12):E583-9. doi: 10.1503/cmaj.121986. Epub 2013 Jul 15. The ratio of blood products transfused affects mortality in patients receiving massive transfusions at a combat support hospital. Borgman MA, Spinella PC, Perkins JG, Grathwohl KW, Repine T, Beekley AC, Sebesta J, Jenkins D, Wade CE, Holcomb JB. J Trauma Oct. 63;(4):805-13. The ratio of fibrinogen to red cells transfused affects survival in casualties receiving massive transfusions at an army combat support hospital. Stinger HK, Spinella PC, Perkins JG, Grathwohl KW, Salinas J. Martini WZ, Hess JR, Dubick MA, Simon CD, Beekley AC, Wolk SE, Wade CE, Holcomb JB. J Trauma. 2008 Feb; 64 (2 Suppl):S79-85, discussion S85. Increased plasma and platelet to red blood cell ratios improves outcome in 466 massively transfused civilian trauma patients. Holcomb JB, Wade CE, Michalek JE, Chisholm GB, Zarzabal LA, Schreiber MA, Gonzalez EA, Pomper GJ, Perkins JG, Spinella PC, Williams KL, Park MS. Ann Surg 2008 Sep; 248(3):447-58. Balanced massive transfusion ratios in multiple injury patients with traumatic brain injury. Peiniger S, Nienaber U, Lefering R, Braun M, Wafaisade A, Wutzler S, Borgman M, Spinella PC, Maegele M. Crit Care 2011; 15(1):R68. The effect of FFP:RBC ratio on morbidity and mortality in trauma patients based on a transfusion prediction score. Borgman MA, Spinella PC, Holcomb JB, Blackbourne LH, Wade CE, Lefering R, Bouillon B, Maegele M. Vox Sang. 2011 Jul; 101(1):44-45. The association of blood component use ratios with the survival of massively transfused trauma patients with and without severe brain injury. Spinella PC, Wade CE, Blackbourne LH, Borgman MA, Zarzabal LA, Du F, Perkins JG, Maegele M, Schreiber M, Hess JR, Jastrow KM 3rd, Gonzalez EA, Holcomb JB, Kozar R; Trauma Outcomes Group. J Trauma. 2011 Aug;71(2 Suppl 3):S343-52. Increased platelet:RBC ratios are associated with improved survival after massive transfusion. Holcomb JB, Zarzabal LA, Michalek JE, Kozar RA, Spinella PC, Perkins JG, Matijevic N, Dong JF, Pati S, Wade CE; Trauma Outcomes Group, Cotton BA, Brasel KJ, Vercruysse GA, MacLeod JB, Dutton RP, Hess JR, Duchesne JC, McSwain NE, Muskat PC, Johannigamn JA, Cryer HM, Tillou A, Cohen MJ, Pittet JF, Knudson P, DeMoya MA, Schreiber MA, Tieu BH, Brundage SI, Napolitano LM, Brunsvold ME, Sihler KC, Beilman GJ, Peitzman AB, Zenati MS, Sperry JL, Alarcon LH, Croce MA, Minei JP, Steward RM, Cohn SM, Bulger EM, Nunez TC, Ivatury RR, Meredith JW, Miller PR, Pomper GJ, Marin B. J Trauma. 2011 Aug;71(2 Suppl 3):S318-28. Optimal trauma resuscitation with plasma as the primary resuscitative fluid: the surgeon’s perspective. Holcomb JB, Pati S. Hematology Am Soc Hematol Educ Program. 2013;2013:656-9. Impact of the duration of platelet storage in critically ill trauma patients. Inaba K, Branco BC, Rhee P, Blackbourne LH, Holcomb JB, Spinella PC, Shulman I, Nelson J. Demetriades D. J Trauma 2011 Dec; 71(6): 1766-1774. Use of respiratory impedance in prehospital care of hypotensive patients associated with hemorrhage and trauma: a case series. Convertino VA, Parquette B, Zeihr J, Traynor K, Baia D, Baumblatt M, Vartanian L, Suresh M, Metzger A, Gerhardt RT, Lurie KG, Lindstrom D. J Trauma Acute Care Surg. 2012 Aug;73(2 Suppl 1):S54-9. Still making the case against prehospital intubation: a rat hemorrhagic shock model. Taghavi S, Duran JM, Jayarajan S, Cruz-Schiavone GE, Milner RE, Gaughan JP, Sjoholm LO, Pathak A, Santora TA, Houser SR, Goldberg AJ. J Trauma Acute Care Surg. 2012 Aug;73(2):332-7; discussion 337. doi: 10.1097/TA.0b013e3182584447. Point-of-injury use of reconstituted freeze dried plasma as a resuscitative fluid: A special report for prehospital trauma care Glassberg E, Nadler R, Rasmussen TE, et al. J Trauma Acute Care Surg. 2013;75(2 Suppl 2):S111-4. The effects of prehospital plasma on patients with injury: a prehospital plasma resuscitation. Kim BD, Zielinski MD, Jenkins DH, Schiller HJ, Berns KS, Zietlow SP. J Trauma Acute Care Surg. 2012 Aug;73(2 Suppl 1):S49-53. The development and feasibility of a remote damage control resuscitation prehospital plasma transfusion protocol for warfarin reversal for patients with traumatic brain injury. Zielinski MD, Smoot DL, Stubbs JR, Jenkins DH, Park MS, Zietlow SP. Transfusion. 2013 Jan;53 Suppl 1:59S-64S. doi: 10.1111/trf.12037. Massive Transfusion Doughty HA, Woolley T, Thomas GO J R Army Med Corps. 2011 Sep;157(3 Suppl 1):S277-83. Blood transfusion and the anaesthetist: management of massive haemorrhage. Association of Anaesthetists of Great Britain and Ireland, Thomas D, Wee M, Clyburn P, Walker I, Brohi K, Collins P, Doughty H, Isaac J, Mahoney PM, Shewry L. Anaesthesia. 2010 Nov;65(11):1153-61. Massive bleeding in polytrauma: how can we make progress? Vincent JL, Dutton R, Parr M, Hauser C. Crit Care. 2011;15(5):196. doi: 10.1186/cc10438. Epub 2011 Oct 11. 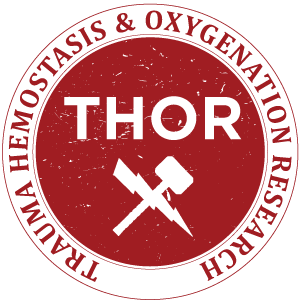 Systemic central venous oxygen saturation is associated with clot strength during traumatic hemorrhagic shock: A preclinical observational model White NJ, Martin EJ, Shin Y, Brophy DF, Diegelmann RF, Ward KR. Scand J Trauma Resusc Emerg Med. 2010 Dec 7;18:64. doi: 10.1186/1757-7241-18-64. Frozen blood products: clinically effective and potentially ideal for remote Australia Holley A, Marks DC, Johnson L, Reade MC, Badloe JF, Noorman F. Anaesth Intensive Care 2013; 41: 10-19. Clearly defining pediatric massive transfusion: Cutting through the fog and friction with combat data Neff LP. Cannon JW. Morrison JJ. Edwards MJ. Spinella PC. Borgman MA. J Trauma Acute Care Surg. 2015 Jan;78(1):22-9. The Effect of a Golden Hour Policy on the Morbidity and Mortality of Combat Casualties Kotwal RS. Howard JT. Orman JA. Tarpey BW. Bailey JA. Champion HR. Mabry RL. Holcomb JB. Gross KR. JAMA Surg. 2015 Sep 30:1-10. Blood transfusion management in the severely bleeding military patient Gurney JM. Spinella PC. Curr Opn Anaesthesiol. 2018 Apr 31:207-214.